I’ve finally bought a cookbook I’ve been eying for some time now. It’s THE bible of luxembourgish cooking and has been completely revamped a few months ago in order to appear more modern and in sync with the current zeitgeist. And it has photographs, something the previous versions didn’t have. My mother used to cook from this book, and before her, my grandmother. And even if they’re not there anymore to teach me their recipes, I can still recreate some of my most beloved childhood dishes thanks to Ketty Thull. For me, luxembourgish food is simple, hearty and comforting, things that couldn’t exactly be labelled as low-calorie, but dishes that keep body and soul together. Some of my favourites as Gromperekichelcher (a kind of potato fritters prepared with onion and parsley and served with stewed apples), Kniddelen (flour dumplings served with bacon and stewed apples – yes, we love our stewed apples!) 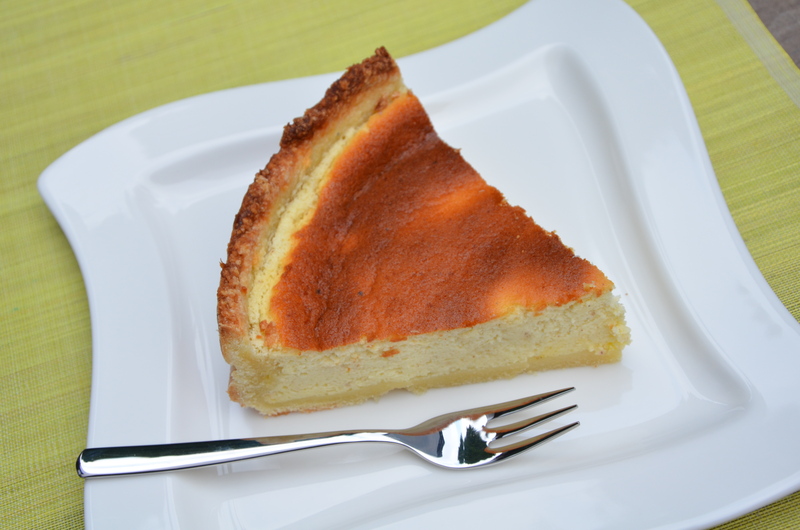 or Kéisstaart, the recipe I want to share with you today. 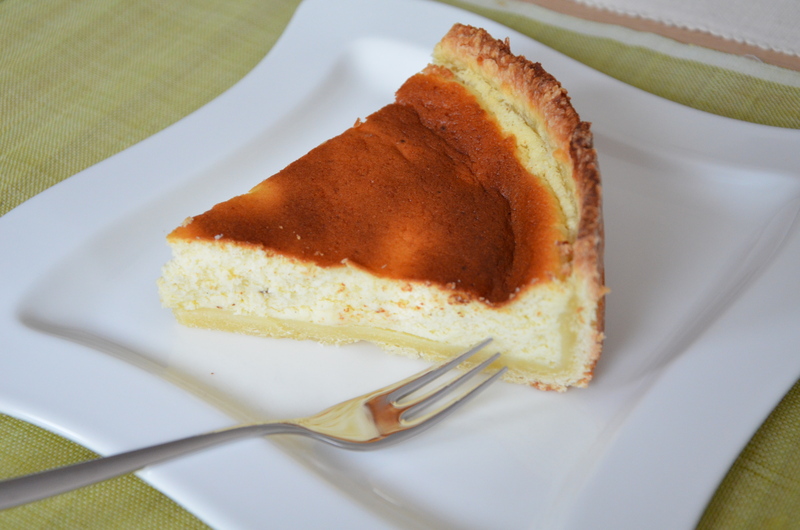 Kéisstaart is a very popular dessert here in Luxembourg, but it’s also well known in our neighbour countries Germany (Käsekuchen) and France (tarte au fromage blanc), for example. The same thing goes for a lot of luxembourgish dishes that have been influenced by the culinary traditions of many different countries. France, Germany, Belgium and Italy probably have probably had the biggest impact on our local cooking and eating habits so far. I love Kéisstart because it is a very simple cake with only a few ingredients, but it comes with a delicate, both sweet and refreshing flavour. The buttery, crunchy crust perfectly complements the smooth, creamy texture of the cheese topping. Kéisstaart is made with what we call “wäisse Kéiss” which literally means “white cheese” and can be found under the term “fromage blanc” in France or “Quark” in Germany. It is quite similar to yoghurt in texture and is often eaten with fruit or cereal. However, I wouldn’t substitute it with yoghurt in this particular recipe. I slightly adapted the recipe from the new edition of the “Lëtzebuerger Kachbuch”. I used a different method to make the crust, added some quark cheese in order to make it a bit softer and replaced the vanilla in the filling with tonka bean. If you’ve never tasted or smelled tonka bean, you should absolutely try it! It is an enchanting smell you will never forget! Pour the flour into the mixing bowl of your stand mixer and add the very (!) cold butter cut into cubes. Make sure to take the butter out of the fridge and cut it at the very last minute. Using the flat beater on medium speed, beat until you get a flaky butter/flour mixture. Add the salt, sugar, egg and quark cheese and beat some more, just until everything is roughly combined. Your dough will still be rather flaky. Flour a working surface and your hands and pour the flaky dough onto your counter top and knead it into a ball. Usually, recipes now call for at least 30 minutes refrigerating time. But I have taken a habit of refrigerating the dough at this point only if the butter is already starting to become slightly runny and shiny. If the dough ball is still reasonably cold, I either refrigerate it for up to 10 minutes or roll it out on a floured surface immediately. I know a lot of people wouldn’t agree, but this works best for me. Thoroughly grease the cake tin. Roll the dough out, making sure that it is large enough to cover the side walls of the cake tin. Do this quickly if you do not want your dough to stick to the counter top! Transfer the dough into the tin. I usually detach it from the working surface with a spatula and fold it over once before transferring it to the tin where I unfold it again. I find the transfer to be safer that way. Cover the baking tin with cling film and refrigerate tin and crust for 30 minutes. For the filling, combine the cheese, sugar, egg yolks, starch and grated tonka bean in a large bowl. Make sure to get an even and smooth texture. Whisk the cream until tiny bubbles form and add to the mixture. Finally beat the two egg whites until stiff and delicately incorporate them into the cheese mixture. Go get your crust out of the fridge and pour the cheese mixture onto the crust. Bake in the oven for 55-60 minutes until the filling is set. If the top of the cake should brown too quickly, cover with tin foil. Let cool in the tin for about 10 minutes, then take it out of the tin and set aside to cool on a cake rack. The filling will set further while it cools.